What Did Jose Canseco, Mark McGwire Have In Common In 1984? Coach Bruce Robinson! Bruce Robinson, in action at Yankee Stadium, 1979. “A Dream Deferred” might be the title of Bruce Robinson’s 1984 season. What could lure him into taking a voluntary demotion from the AAA Pacific Coast League to class A Modesto? He wasn’t being offered just any player-coach role. Bruce was being assigned two special projects. “Yes, I was midway through 1984. Oakland management asked me, while playing in AAA Tacoma, if I would be interested in working with two young players in Modesto. One was having severe mechanical issues with his swing and the other would be arriving after his stay with the U.S. Olympic team. The first was a 6’3” 190 pound Jose Canseco and the other, Mark McGwire, then 6-foot-5, about 210 lbs. We won the California League in 1984 in mid-September. By March, both players had ‘blossomed’ into 250 lb. hulks…amazing milk shakes and weight lifting programs! Q: How did you assess their potential before you arrived and after you assisted? A: Canseco could run, throw and had power, but his swing was a mess, along with the timing of the swing stages and where his bat was at each stage. He had promise, but nobody could foresee what steroids and weight lifting would do for him. McGwire was much more polished, but his swing was tired from playing so much since January with USC and then the Olympic team that summer after the draft. Again, good looking, short swing and a nice young man, but 70 HR potential at that time? No chance. Steroids, steroids, steroids, combined with ability and weight training. Q: Sorry, gotta ask: people remember Terry Cashman’s baseball songs. Some people will ask…have you thought about writing and performing songs about your baseball career? A: No, but I have worked a few lines into a couple songs about playing catch or playing ball. A: Absolutely. I have started returning all of my autograph requests with a Bruce Robinson Music business card and a note pointing them to my music website. There are links to The Robby Pad, other baseball sites, photos of baseball and music, a store, song sampling and song lyrics, etc. Thank you for your kind words. If you haven’t yet, check out www.BruceRobinsonMusic.com. Who knows? All good baseball movies need soundtracks. Bet on hearing more from this dream-following diamond alum in the future. Coming Monday: Billy Sample gives an A+ to a collector! Billy Sample Collects Fan Mail! 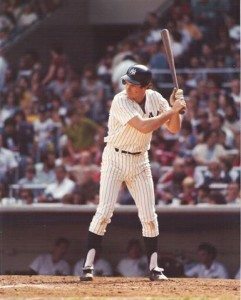 Love that ’79 photo with the high stirrups and NO batting gloves! Is that a ukelele he’s playing in the current photo? Funny on the stirrups, now coming back in style. My oldest son, Scott, who played 8 yrs of pro ball, wore high stirrups during high school. He started a trend in San Diego, especially his senior year in 2002 at Rancho Bernardo HS where he was teammates with Cole Hammels (1st round Phillies 2002), Jake Blalock (5th round Phillies 2002) and brother of Rangers all star 3b Hank Blalock), Johnny Drennon (1st round Indians 2005), Allan Dykstra (1st round Padres 2008). 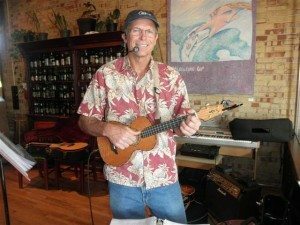 I have been playing ukulele since May 2010 and have 6, 3 custom. I have played guitar since I was 18. Thank you, Bruce! The hobby appreciates you, too. Tom Owens has been collecting baseball autographs by mail since 1972 (thanks to "Bullet" Bob Veale). As "Thomas S. Owens," he's written more than 50 books, many about sports or collectibles. Write to Tom at: BaseballByTheLetters [at] gmail [dot] com. Would Charlie Brown respond to your TTM autograph request? Enter your email address to subscribe to this blog and receive notifications of new posts by email. There are currently 40 subscribers.